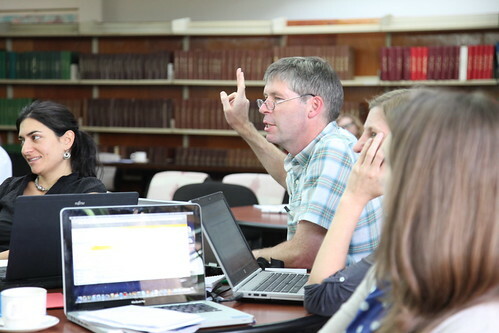 NBDC Reflection and Roadmap workshop, 21-22 May 2012, ILRI Addis Ababa, Ethiopia (photo credit: ILRI/Zerihun Sewunet). On 21 and 22 May 2012, the Nile Basin Development Challenge (NBDC) team held a reflection and road map meeting with 24 participants from the four projects that make up the NBDC as well as from the Management Team of the Challenge Program for Water and Food (CPWF). Participants reported on progress (see a report from the ‘Nile 4’ project), assessed whether NBDC is on the right track, identified the NBDC’s comparative advantages, crucial gaps and potential adjustments and, finally, developed an action plan that integrates monitoring and impact assessment and folds into a ‘sunrise strategy’ as the NBDC (and its parent CPWF) is scheduled to end in 2013. The keywords for this important meeting have been: alignment, integration and indeed sunrise. The pressure to deliver science and show results is mounting in the CPWF generally. For the NBDC this means the component projects should emphasize and deepen collaboration and synergies with one another. Beyond internal alignment of the different projects, a major challenge is to ensure the NBDC is integrated with other research and development initiatives – as both outlets to disseminate its research results and to engage audiences around the research insights gathered so far and the tools and approaches developed by the various NBDC teams. The Africa RISING program and initiatives by e.g. the Food and Agriculture Organization of the United Nations or the United Nations’ Environment Program were some of the initiatives mentioned that could help pave the way for the sunrise strategy. Although the program comes to an end in late 2013, the team wants to see this not so much as a sunset but rather as a sunrise, the start of a new and exciting period. During the meeting, the team started brainstorming a vision for 2014 and beyond, which builds upon the different innovation platforms – which should also be further integrated. The way to the sun? 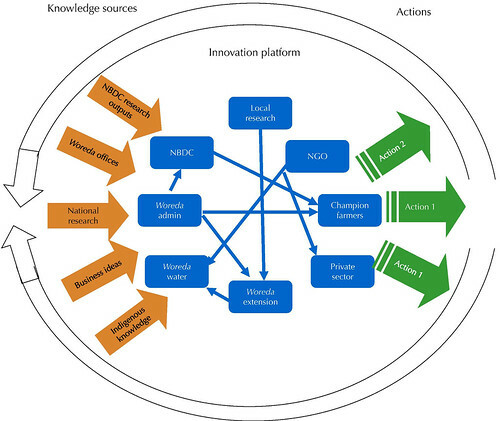 The comparative advantage of the NBDC was seen to lie in the combination of research outputs and development outcomes, the integrated approach at multiple scales and the program’s reputation for its knowledge brokerage function. Mobilizing these assets through a ‘sunrise strategy’ will stimulate integration and alignment in the best possible way. The meeting was documented through notes on the wiki and some photos from the meeting. With a 45-person delegation, the Nile Basin was well-represented at the third International Forum for Water and Food. The Forum, which took place in Thswane, South Africa, from 14 to 17 November 2011, brought about 300 representatives from the six river basins of the CGIAR Challenge Programme on Water and Food, as well as a host of other international actors. Spatial analysis and modeling. See the Twitter report; podcast interview with Catherine Pfeifer. The Africa Initiative session. See the Twitter report. Livelihoods. See the Twitter report. Global drivers. See the Twitter report. Multiple use systems and integrated water resource management (MUS-IWRM). 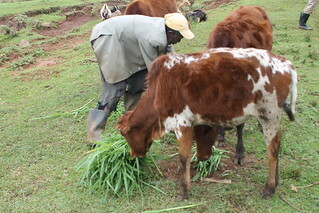 See the Twitter report / Blog post: Integrating livestock into rainwater management systems in Ethiopia. Research to policy. See the Twitter report. ‘Happy strategies’ game around rainwater management. Blog posts:Jegerida – The ‘happy strategies’ game matches landscape needs with rainwater interventions – ‘Happy strategies’ – where strategic land and water management is as simple as playing a game. Participatory video as a means of capturing community perspectives on rainwater management. Blog post: A look at the potential benefits of participatory video in river basin communities. Scaling-out termite management options for resilient and productive productivity livelihoods in Eastern Africa. Spatial analysis and modeling poster and discussion. Posters focusing on the different Nile projects were exhibited at the stand. Moreover, two NBDC technical reports on the review of development of key national policies with respect to rainwater management in Ethiopia prepared by Ethiopian Economics Association and on promoting improved rainwater and land management in the Blue Nile (Abay) basin of Ethiopia were distributed at the stand. Seven briefs of the Nile were also distributed. 5. Contributing to the social reporting of the Share Fair with about 300 tweets, three videos, ten blog posts, various pictures and capturing the presentations. Read a related blogpost. 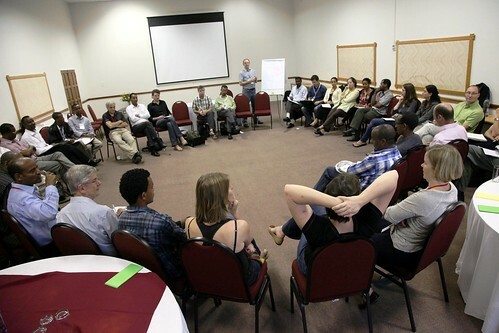 On the final day of the event (Thursday 17 November), the whole group gathered to review the insights garnered by the whole team during the week and to devise ways forward, building upon what happened at the Forum. Among the great results achieved, the NBDC team is involved in various topic working groups either to lead (livelihoods, spatial analysis modeling) revitalize (multiple use systems) or support (resilience). 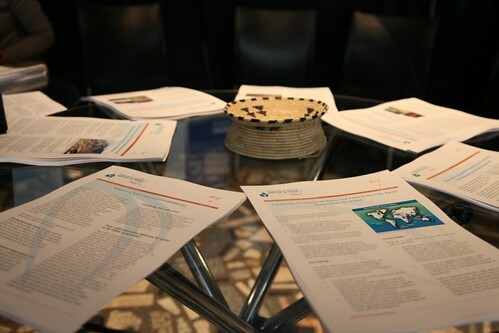 In addition, under the leadership of Basin coordinator Tilahun Amede, a group of representatives from the three African basins will coordinate the development of a publication synthesising evidence produced on the topic of rainwater management in Africa. Amede is also heralding discussions with other basin leaders to consider setting up a network that would extend cooperation around rainwater management on the continent. The next National Platform meeting (19 December 2011) will be a crucial moment to bring together all these results to the wider group of stakeholders in Ethiopia, including the young professionals who were empowered to join decision-making processes regarding water and food management during the Forum. The Nile delegation has now flowed back up to its familiar banks but the knowledge confluents of the age-old Nile are growing in all directions. The next year may see the Nile banks, and its people, flourish with new ambitions. See also the Forum website.